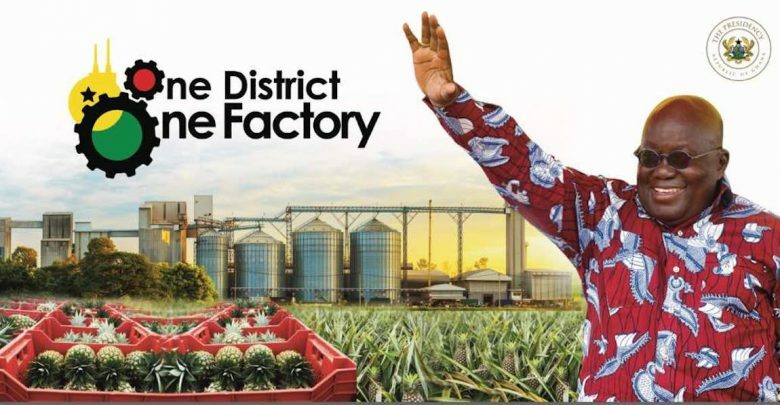 Five participating financial institutions under the One District One Factory (1D1F) Programme have committed various amounts of funds towards some 73 businesses submitted to them by the Secretariat. On top of the list is EXIM Bank of Ghana, which funded 38 projects, the Agricultural Development Bank, gives conditional approval to 28 projects, GCB Bank has funded the Kete Krachi Timber Recovery Limited Project to harvest submerged trees in the Volta Lake in addition to four others. Additionally, the UMB and the Standard Chartered Bank have funded one project each. Mrs Gifty Ohene-Konadu, the National Coordinator of the One District One Factory Programme, announced this on Friday in Accra. She said the factories would be commissioned as and when President Nana Addo Dankwa Akufo-Addo made time to cut the sod and commission them. She urged Ghanaians to be optimistic about the programme and be assured that the IDIF “is something that is real and it is going to work”. Speaking to journalists on the side-lines of a stakeholder engagement involving business enterprises on board the 1D1F programme on the Requirements and Standards, Mrs Ohene-Konadu said, currently, work on the projects was ongoing at various sites all over the country. Among the stakeholders that participated in the forum were promoters under the 1D1F who have submitted their business plans and whose projects have either been approved and received funding or are in the pipeline and ready to receive funding. The 1D1F Secretariat, in collaboration with the Ghana Standards Authority (GSA), organised the engagement for the participants to discuss issues related to standards, certification and other related matters that affect their upcoming businesses under the 1D1F programme. Mrs Ohene-Konadu said the achievement of the goal of economic development through industrialisation, would require strict adherence to standards, since it formed the fundamental building blocks for product development. She said standards also helped to establish consistent protocols that could be universally understood and adopted and that would help engender accessibility to both local and international markets, while simplifying product development. “This is because it is only through the application of standards that the credibility of the new products to be churned out of the factories can be verified. The bottom-line is that the consumers will have confidence that the products are safe, reliable and are of good quality”. Mrs Ohene-Konadu said if consumers were going to patronise the outputs from the factories, then the Secretariats would depend heavily on various institutions like the GSA, Food and Drugs Board (FDA), the Environmental Protection Agency (EPA), among others to provide proactive standards to guide the business promoters. “We need to ensure that all factory environments are non-hazardous and production activities do not harm the environment in any way. Producing for international markets imposes additional requirement to meet different cultures, attitude and unique preferences,” she said. Professor Alex Dodoo, the Director General of GSA, said standards were essential to enforcing honesty in trade, adding that: “Standards are the language in trade” and so factories under the 1D1F would have to conform to standards so their products would be accepted both locally and internationally. He said the GSA was ready to support the 1D1F programme and promoters with the needed advice and resources that would make their products meet international standards. Mr Kofi Essel, the Head of Food and Industrial Services at FDA, said the Authority was ready to partner with GSA and EPA to assist the 1D1F promoters to set up and operate within required standards, ensuring the safety of food, goods and services. Mr Augustine Collins Ntim, the Deputy Minister of Local Government and Rural Development, said the Government was determined to ensuring the success of the 1D1F programme, which was mainly being implemented at the district level. He said the Ministry was, therefore, working to engage all metropolitan, municipal and district level officials to train then and give them the necessary orientation to help them appreciate and support the projects within their jurisdictions.